Campsie Fells Haven in Lennoxtown, near Kirkintilloch, Glasgow & Clyde Valley sleeps 3 people. 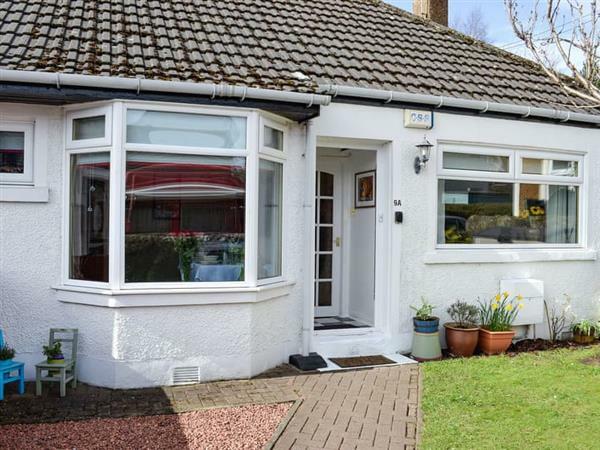 Campsie Fells Haven near Kirkintilloch is situated at the foot of the Campsie Fells in Lennoxtown; this charming cottage with private rear garden is ideal for walkers and cyclists alike. There are numerous walks available locally with the nearby Clachan of Campsie being ever popular. Murdock Country Park, with a garden centre, is 4 miles from the property and is a good place for dog walkers. The Queen Elizabeth Park and Loch Lomond and the Trossachs National Park are close by with walking, cycling, fishing, golfing, horse riding and water-sports on offer. The area holds a magnificent diversity of scenery with dramatic peaks, waterfalls, hidden caves and mysterious, forest covered slopes. The city of Glasgow with galleries, museums, historical attractions, superb nightlife and fantastic shopping is a 20-minute drive away or you can easily catch a train, while Stirling and Edinburgh are also easily accessible. The beach is 22 miles from Campsie Fells Haven near Kirkintilloch. With the shop 200 yards, the pub is 300 yards, and the restaurant is 400 yards from Campsie Fells Haven. Living room: With 32 Freeview TV and wooden floor. Kitchen: With electric oven, gas hob, microwave, fridge/freezer, washing machine and door to garden. Bedroom: With super king-size bed. Gas central heating, gas, electricity, bed linen and towels included. Welcome pack. Enclosed lawned rear garden with sitting-out area and garden furniture. Bike store. Private parking for 2 cars. No smoking. Holidays at Campsie Fells Haven run from Friday to Friday. Pets allowed at Campsie Fells Haven. For a better idea of where Campsie Fells Haven is, you can see Campsie Fells Haven on the map below. Campsie Fells Haven is in Lanarkshire; should you be on the lookout for a special offer, you can find all the special offers in Lanarkshire. It's always worth checking to see what is on offer at the moment. Do you want to holiday near Campsie Fells Haven (UK11219), you can see other cottages within 25 miles of Campsie Fells Haven; have a look to find your perfect holiday location.